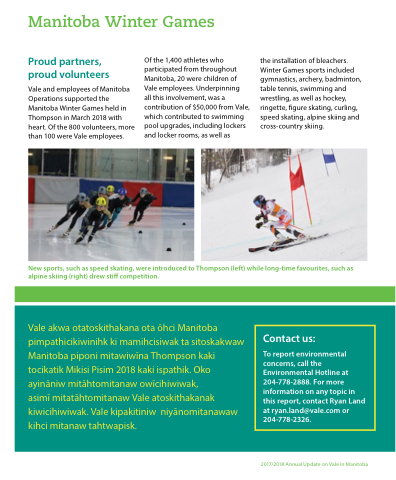 Vale and employees of Manitoba Operations supported the Manitoba Winter Games held in Thompson in March 2018 with heart. Of the 800 volunteers, more than 100 were Vale employees. the installation of bleachers. Winter Games sports included gymnastics, archery, badminton, table tennis, swimming and wrestling, as well as hockey, ringette, figure skating, curling, speed skating, alpine skiing and cross-country skiing. New sports, such as speed skating, were introduced to Thompson (left) while long-time favourites, such as alpine skiing (right) drew stiff competition. asimī mitatāhtomitanaw Vale atoskithakanak kiwicihiwiwak. Vale kipakitiniw niyānomitanawaw kihci mitanaw tahtwapisk. To report environmental concerns, call the Environmental Hotline at 204-778-2888. For more information on any topic in this report, contact Ryan Land at ryan.land@vale.com or 204-778-2326.